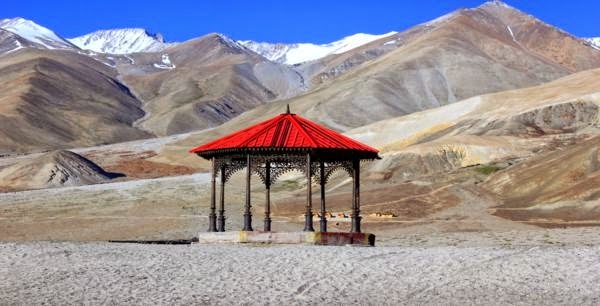 This is the last day of our trip and our plan was to explore pangong lake as much as we can in the first half of the day, then proceed to chang la, spent time in chang la, proceed to leh, then visit Leh palace and shanti stupa. 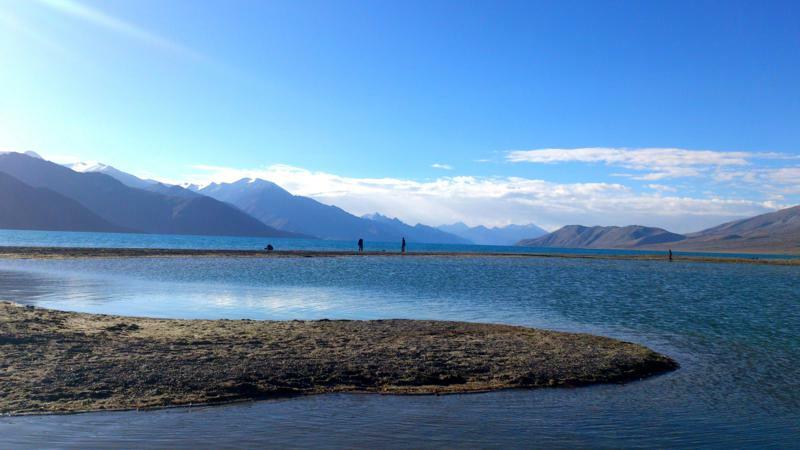 We woke up at around 7AM and went towards the pangong lake. 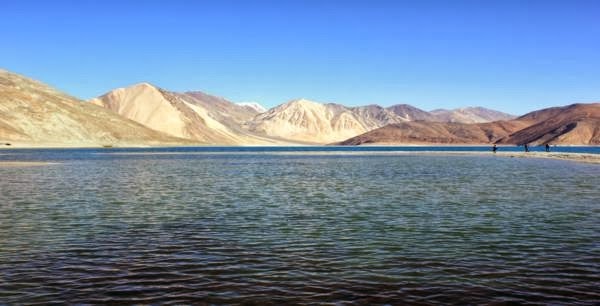 As we reached pangong lake in the evening, we didn't explore the lake much on the previous day. 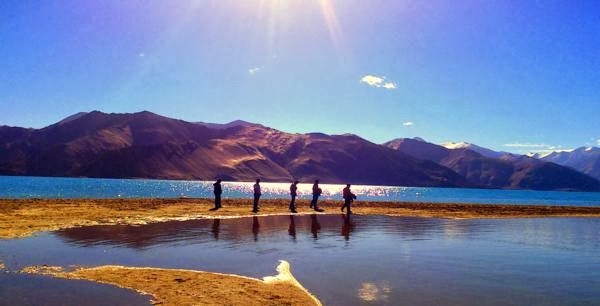 So we started walking along the bank of pangong lake. After walking for half km, we realized that we can't able to explore the lake by foot, as the lake very long and also we have very less time. 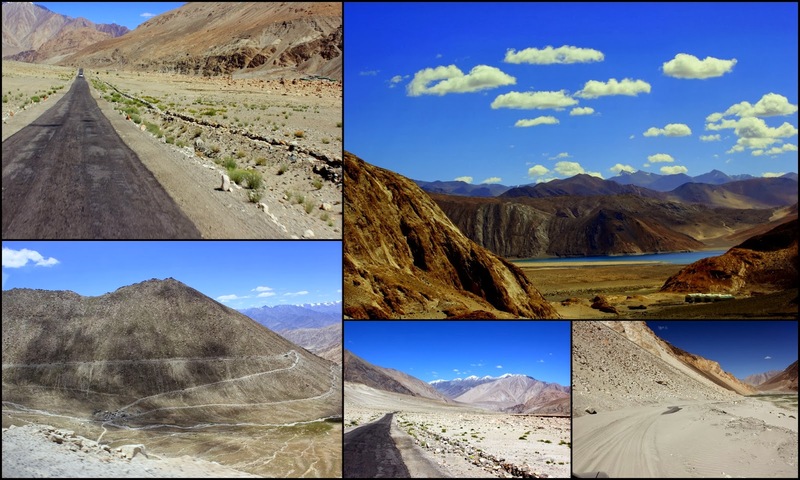 So we called our driver and asked him to take us to the best place near pangong lake. 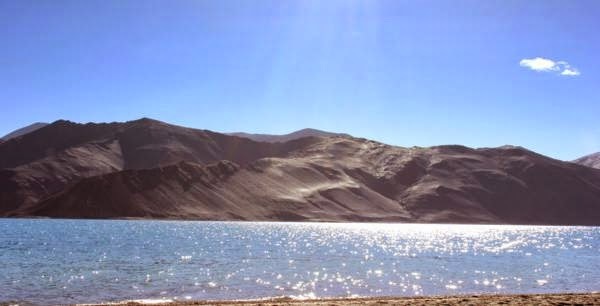 We traveled for 15 minutes on road, then another 20 minutes off road and reached the most beautiful place in Pangong lake. Remember the three idiots climax shot??? We were at the same location. We were speechless and every one started running towards the lake. 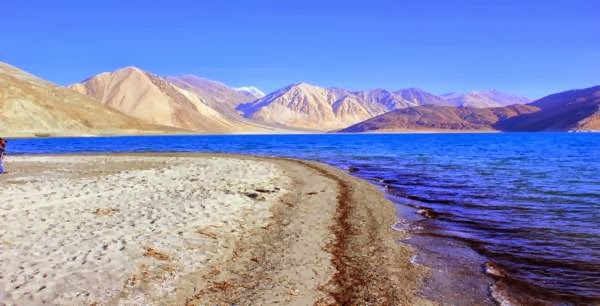 This is the best place to enjoy the beauty of pangong lake. The water was so clear and very cool. 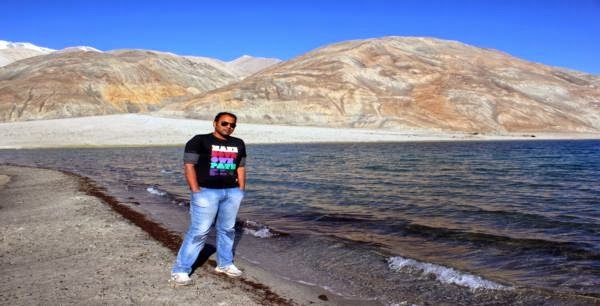 We spent almost 1 hours taking pictures, playing with water, enjoying the beauty of pangong and surrounding mountains. This is the best part of our entire trip. 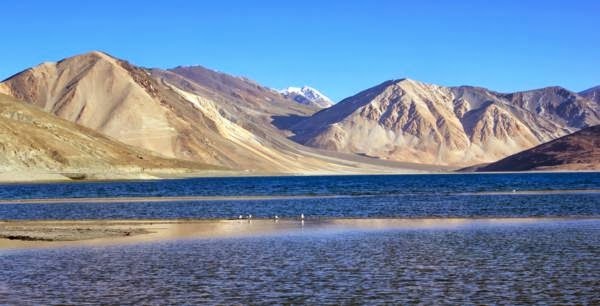 I can't able to explain the beauty of Pangong lake, no words can describe its beauty, probably the best place to visit in India. 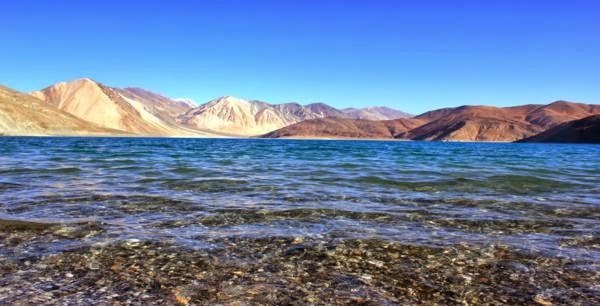 Visiting pangong lake is an life time experience. We reached our camp, packed every thing, ate breakfast and started our return journey to leh. On the way we saw many army vehicles carrying weapons and field guns to pangong lake, probably because of the Chinese intrusions near pangong lake. As the road was blocked by the land slide on the previous day, there was a huge traffic from leh side to visit pangong lake. We reached chang la by 12 PM, and by that time, BRO completed repairing the land slide effected road. 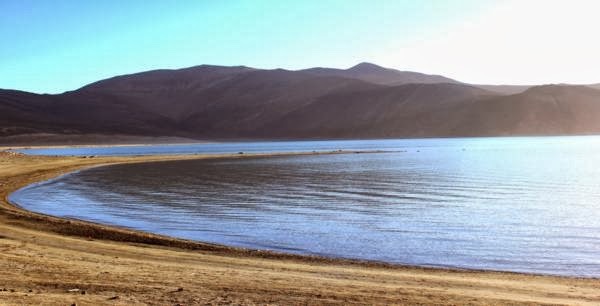 From pangong lake, it took almost 5 hours to reach leh. After reaching leh, we went for having lunch at a local restaurant and proceeded for visiting leh palace and shanti stupa. Leh palace is located in the center of the leh city. Leh palace is a nine storey building constructed in 17th century, but was abandoned by the royal family in 19th century and they moved to shey palace. From leh palace, you can get good view of market and city. Even though it was built with mud plaster, the palace walls and so strong even now. It was a different experience going through the narrow stair cases, ladders inside the palace. We went till the top floor of the palace. We next visited shanti stupa, which is located in leh city, on top of a hill. It was constructed in 1991 and enshrined by dalai lama. 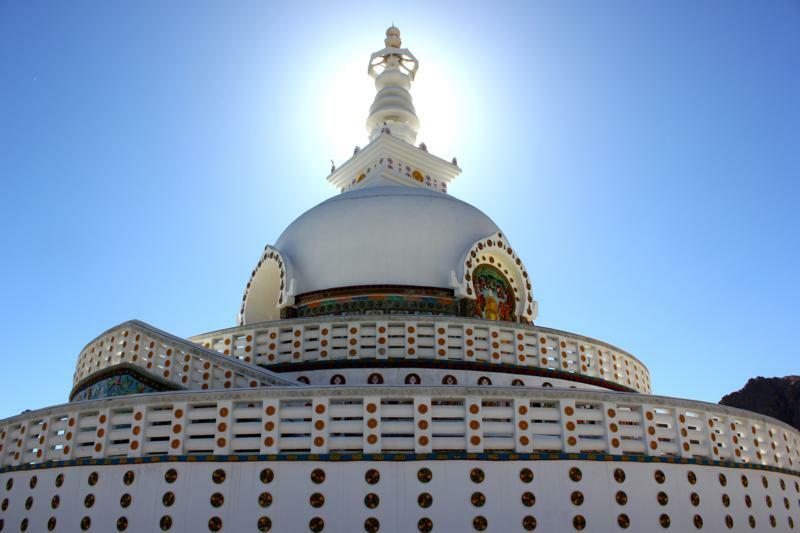 Shanti stupa provides beautiful and panoramic view of the surrounding landscape. This has become a primary reason for Shanti Stupa to become a popular tourist attraction, apart from its religious significance. After a two day long trip to pangong lake, we reached hotel by 6 PM. Every one was so happy that every thing went well as per the plan and we didn't missed anything, even though we started our trip one day late. On that evening, we celebrated the trip success, discussed the best moments in the trip, photo sharing and of-course 'Vote of Thanks'. After the party, we packed every thing, and slept at around 1 PM. Next day we woke up early in the morning, and boarded our return flight at 8AM to Delhi. 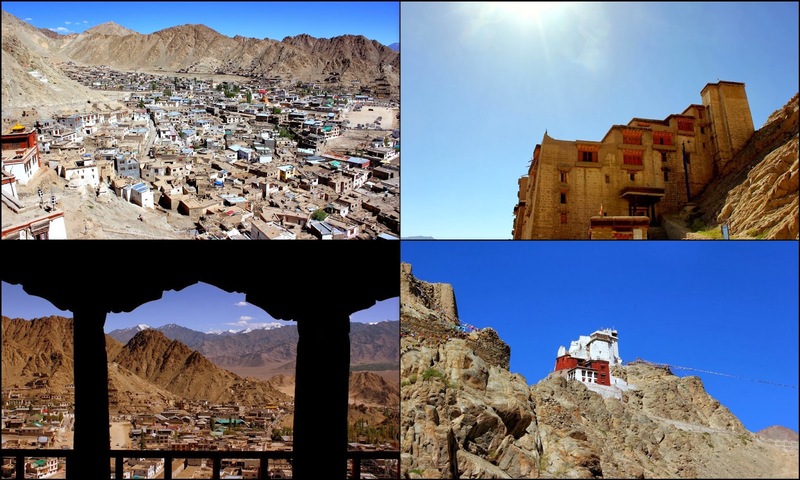 With this post, I gonna end the tales from ladakh. I really enjoyed writing this ladakh series. Last but not the least, I should thank our driver ALI, who was with us for the entire trip, helped us in making our trip memorable.